Ahead of the UFC and boxing fights this weekend Mike Pendleton joins the show. We talk about UFC 236, what is in store for us this weekend and a little update on Pendleton's life in MMA Media and what he has in store for the rest of 2019. A little belated due to technical difficulties but we were recently joined by Alex Perez. Fresh off his victory over Mark De la Rosa, Perez talked about his thoughts on the flyweight division, his recent uprise in the UFC and gives his thoughts on UFC 236. After five highly successful fight cards, Bare Knuckle Fighting Championship is certainly on the radar of exciting combat sports. This week, the voice of Bare Knuckle Fighting Championship Jeff Houston, joins the show. Being a native Texan, Houston talks with us about the combat sports game in Texas. 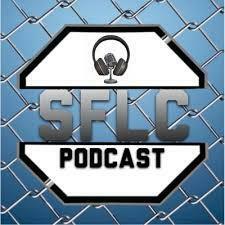 We discussed the popularity of boxing and also the lack of popularity of MMA in Texas. Tune in to a fun interview with Houston and decide for yourself who wears a suit coat better. This week we keep our attention on the upcoming UFC card with Mark de la Rosa's weight management specialist, Dylan Dunnington. Dunnington is a member of Lockhart and Leith and just returned from Houston, TX as Mark's specialist and chef. Dunnington talked to us about his fight career, joining Lockhart and Leith and being a new father. After an historic fight card between Errol Spence and Mikey Garcia, Premiere Boxing Champion ring announcer, Ray Flores, joins the show. Flores breaks down the card we saw over the weekend and how special of a fighter Spence is. We discuss where both fighters go from this weekend. Later Flores informs the show of Deontay Wilder's latest fight agreement. Check out all that is going on with Ray Flores and his career in boxing commentary. Our first interview of the week focuses on the opening UFC bout on UFC on ESPN 2 between Mark De La Rosa and Alex Perez. While Perez is coming off a 2018 loss to Joseph Benavidez, De La Rosa looks to continue his win streak after his split decision victory over Joby Sanchez. De La Rosa is eyeing a submission victory over Perez on March 30 on UFC on ESPN 2. In another bonus epsiode, Din Thomas of American Top Team joins us. We chat about Tyron Woodley's fight against Usman and the current state of the welterweight division. Who should get the next title shot at 170? Tune in for Din's pick. Catching up after the first week of South X Southwest, we get a bonus episode this week with Angelo Reyes. Angelo informed all of us on the effects of Congenital Heart Disease and how we can all help. Afterwards we discussed Errol Spence Jr. v. Mikey Garcia a little more in-depth. This week we are joined by Blake Stephenson of the Unfiltered Bachelor Podcast. We talked about the upcoming fight between Errol Spence Jr. and Mikey Garcia. We also touch on MMA news including Conor McGregor's newest troubles and breakdown the upcoming London card. After a quick break, we are back at it this week with Shane "War Rhino" Kruchten. Kruchten takes on Daniel Straus at Bellator 219 at the end of March. We discussed his loss against Aaron Pico, his experience in the Marines and his take on Dillon Danis' suspension by the Nevada State Athletic Commission (note: originally stated the punishment was handed down by Bellator).